Foodservice Gateway » Aussie first innovation makes grill station operation easier! Aussie first innovation makes grill station operation easier! When it comes to grilling stations, you might think choosing a non-stick machine is a no-brainer. 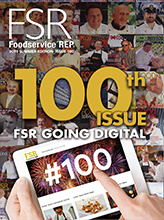 But as many foodservice professionals have learned from experience, that’s not always the best choice for your business. Unlike the machines designed for domestic use, a professional grill station has to be a workhorse – the constant use places demands on it that the non-stick surface isn’t designed to cope with. A better solution is to use a non-stick sheet, but the problem with this has always been securing it to your grill station. Now the clever people at Roband Grill Stations have developed an ingenious solution. Their engineers have designed a food grade non-stick sheet with a clip mechanism to attach it to the grill station. The sheet can be easily clipped in place so you can run your Roband Grill Station just like a non-stick machine – but the sheet can be removed, cleaned, and discarded and replaced hen necessary. If you need to prepare food in accordance with strict requirements (eg Halal preparation), a fresh, never-before-used non-stick sheet makes this easy – just clip it to your grill station and you’re ready to go. As well as helping to keep your grill station clean and well-presented, the PTFE sheet helps prevent food from sticking during cooking and prevents spillage baking on or carbonising on the grill plates over time. According to Roband’s customer feedback, using the sheet can also produce a more flavourful cooking result, helping to heat thick items like focaccia. In fact the sheet helps to minimise the risk of burning the outer part of the food being grilled. The clips to attach the sheet to the grill station comes in two sizes – one for the six slice Roband Grill Station and a larger size for the eight slice machine. The non-stick PTFE sheets come in packs of 5 and 10 and can be used multiple times until they wear. Two sizes are available, with each fitting neatly across the grill station’s top and bottom plate so that the top of the sheet stays in place when you lift up the lid. You can also use the clips to hold your own baking paper or aluminium foil if necessary. 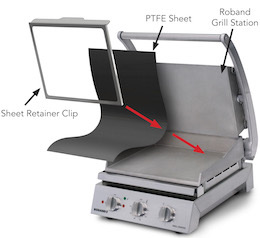 The new PTFE Sheet and Clip for Roband Grill Stations is a genuine Aussie first – designed in Australia by Australian engineers, it’s clean, simple and makes your life easier.